It’s pretty much impossible to have been a fan of melodic hard rock and not have heard of TEN. The British melodic rock band, often dubbed one of the best in the genre, have been around for the last 22 years. With 12 studio albums under their belt, plus a number of EPs, live and compilation albums, they’ve certainly made their mark on the melodic rock scene. The bands lead singer and songwriter, Gary Hughes, has also made a quite a name for himself as a solo artist with 6 albums since the late 80’s, most notably with the two rock opera albums “Once and Future King” part 1 and part 2, which revolved around the legend of King Arthur and featured a host of top guest musicians from other bands. He also wrote and produced the first three solo albums by Magnum’s lead singer Bob Catley, wrote and produced “Circle Of Knives” by fellow British band Serpentine, produced Hugo’s debut and has appeared on albums by Ayreon and Vinny Burns. When someone with that sort of history releases a new studio album, we take note. So we had a listen to TEN’s upcoming album “Gothica”, due release on July 7th via Frontiers Music srl. TEN’s 13th studio album “Gothica” sees Gary Hughes joined once again by long serving band members Steve McKenna on bass and John Halliwell on guitar, alongside guitar players Dann Rosingana and Steve Grocott, drummer Max Yates, and keyboardist Darrel “The Shadow” Treece-Birch (a solo artist in his own right, Treece-Birch also plays keys for prog band Nth Ascension). “Gothica” is their third outing as a collective unit. Mixed and mastered once again by Dennis Ward (with whom TEN have been associated since the 2011 album “Stormwarning”) and produced by Gary Hughes, “Gothica” is a tapestry of rich keyboard, bass and drums threads overlaid with stunning guitar work, with Gary Hughes’s rich vocals woven throughout the whole as he brings the nuances of the intricate lyrics to life. I’ve always admired Hughes as a lyricist, as his writing is so often poetical in nature, describing and telling stories of epic proportions (for example, “Red”, “Arcadia”, “Ten Fathoms Deep”, “Fear The Force”, “Name Of The Rose”, “The Robe”, or anything from the album “Babylon”. I could go on, but you get the point). This album is no exception to that legacy as Gary Hughes takes on a musical journey through a land of history and horror, with tales of human nature, romance, filled with rich characters, many of whom are depicted on the fantastic cover artwork, an original piece by Stan W. Decker, which depicts a beautiful enchantress summoning shadowy characters from the pages of a book. Stan has cleverly illustrated the piece in order to portray the characters emerging from the book’s pages as the actual characters from the songs on the album. From the slick guitar intro of “Gothica”‘s epic 8 minute opening song “The Grail”, through to the keys at the end of the track, the song had taken me on a quest with a group of crusaders, and my hopes were high that this was going to be an album which merged the best elements of TEN’s songwriting and performance. From “The Grail” the album moved onto the very catchy “Jekyll and Hyde”, before arriving at “Travellers”, one of my personal favourites on the album, a song which is best described as a threefold cord of beautiful writing, heartfelt vocals, and soaring guitars (and it was at this point that I went and pre-ordered the CD). Next came another highlight, “A Man For All Seasons”. A fairly epic intro made me think I was at a jousting tournament, waiting for the lances to tip. Of course, for me, the show had already begun. Once we’d got into the main body of the song, it was a genuinely catchy song which once again featured some fine work by the bands trio of guitarists. From there we went into the melodic “In My Dreams”, which felt like a piece of commercial rock perfectly designed for radio, and could have fit straight onto the bands “Far Beyond The World” or “Stormwarning” albums. “The Wild King Of Winter” starts off slowly, with a dark, almost sorrowful piece of beautiful music, leading into rhythmic guitar with a fantastic beat, and some great guitar solos, as well as a catchy chorus and some very prog leaning keys from Darrel Treece-Birch, a man whose surname is even cooler than his nickname. After that was the first promo for the album, “Paragon”. I won’t say much about this song, since I’ll embed it further down, other than the fact that while I wasn’t convinced by the early part of this song I did enjoy it as the song progressed, but having listened to the whole album it struck me that it was probably my least favourite song on the album, and a surprising choice to lead with. After that we were off to the circus with “Welcome To The Freak Show”, a catchy song of dark eroticism which would be great for radio. From there we ride with the damned in “La Luna Dra-cu-la”, a song which has far more of a feel good factor to it than the name suggests. Opening with a pretty sweet riff that returns throughout the song, the song has a great rhythm overlaid with some solid solos and the fantastic vocals of Gary Hughes. The album concludes with the ballad-ish “Into Darkness”. A song about the fickleness of the movie industry and lost forgotten starlets (well, thats how I interpreted it), the song starts off the sound of an old cinema reel, and Hughes singing, ‘A cinematic masterpiece, in ashes on the mantelpiece, a luminescence time could never fade..’ once again the song has some beautiful guitar work, and the pairing of Gary Hughes vocals and and keys by Treece-Birch is fantastic. Verdict: 10 out of 10 (from TEN). I wasn’t sure if there would be any real challengers to “Monumentem” by Eclipse for Paradise Rock UK’s album of the year, but this is a real heavy contender. A rich tapestry of an album, full of beautifully written songs, with fantastic guitars, great rhythm and keys, all overlaid with the rich voice of Gary Hughes. Definitely one of the best albums this year. Highly recommended, I’d been and pre-ordered my copy from Amazon by track 3. (Editorial Note: we don’t usually do this, but after further plays I upgraded this albums rating from a 9.5 to a full 10. This album is superb and gets better with each play). 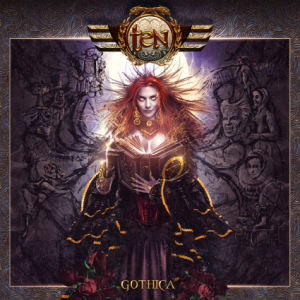 “Gothica” by TEN will be out July 7th via Frontiers Music srl. Gary Hughes – Vocals, Backing Vocals, Guitar, Bass and Programming.